Microsoft announced in May 2016 its renewed commitment to a maturing SharePoint product – Microsoft would modernize SharePoint for an increasingly mobile and cloud-based user base. At the SharePoint Virtual Summit this year on May 16, Microsoft revived that commitment, delivering on some of their promises from last year as well as making new ones. Let’s review highlights from SharePoint Virtual Summit 2017. More than 10 million new SharePoint sites have been created. 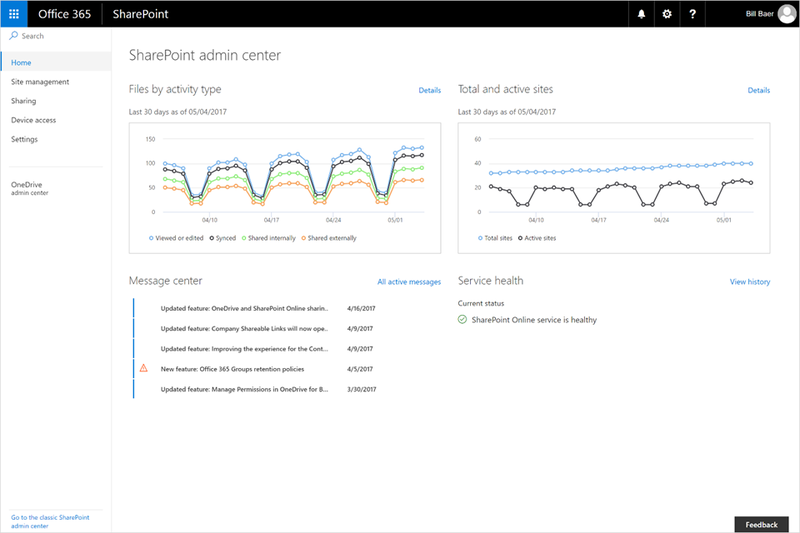 Jeff also shared that more than 60 percent of SharePoint seats are now online, highlighting the strong movement to Office 365 and the cloud. It is not only clear that SharePoint is here to stay but that it is also evolving rapidly as users continue to migrate to the cloud. To that end, Microsoft laid out several new features meant to accommodate the evolving needs of this increasingly cloud-based user base. This was actually announced a few days earlier on Office Blogs. 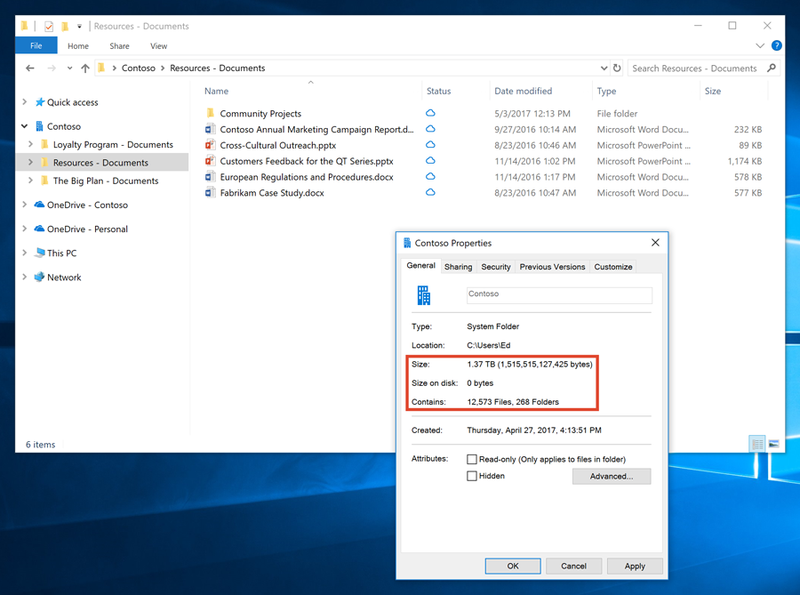 Fundamentally, OneDrive Files on Demand allows users to see all of their files on any device, but you get to choose which files are stored locally. That is, you only download the file when you need it so that it’s not sitting on your device taking up space when you aren’t using it. In the screen shot below, you can see the new “Status” column with the cloud icon to indicate that the files are not stored locally but are stored in the cloud. The Properties window for the folder, however, shows the total size of the files as well as the “size on disk”, which, in this case, is zero. For files that you need to access when you don’t have an internet connection, you can easily make files or folders always available by right-clicking and selecting Always keep on this device. The new OneDrive Files On-Demand feature will be delivered with the Windows 10 Fall Creators Update. Starting this summer, Windows and Mac users will be able to share their OneDrive files with anyone inside or outside the organization. 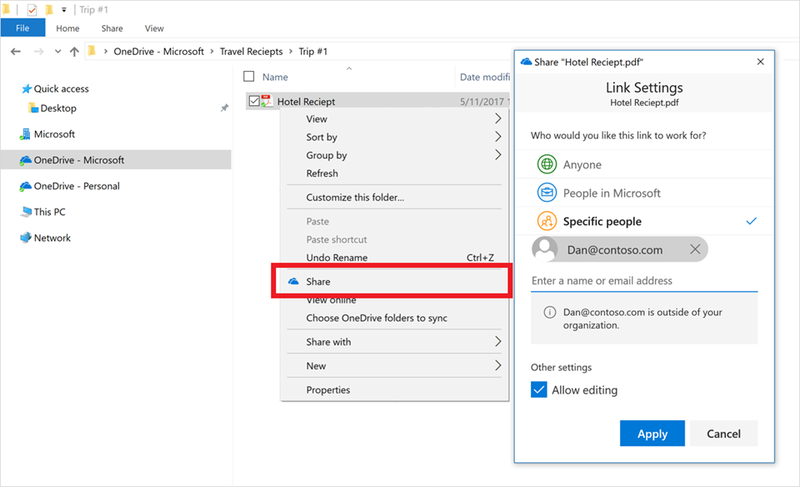 This is a powerful feature as it introduces native sharing capabilities right in the Windows and Mac file folders. This feature, along with the ability to access and download files on demand, significantly improves the integration of OneDrive across all devices, furthering Microsoft’s efforts to surpass competitors as the storage mechanism of choice. Also, announced yesterday are the new communication sites coming to first release clients in the second quarter of this year and rolling out more broadly in the third quarter of this year. Communication sites are out-of-box sites you can use for internal campaigns, reports, product launches, and other scenarios that address broad audiences across the organization. Communication sites are easy to create: they require no code or design expertise. Simply point-and-click to add pages and parts. Communication sites are mobile-ready by default, looking great across browsers and devices, and in the SharePoint mobile app. And there will be a few new web parts coming as part of the communication sites rollout. 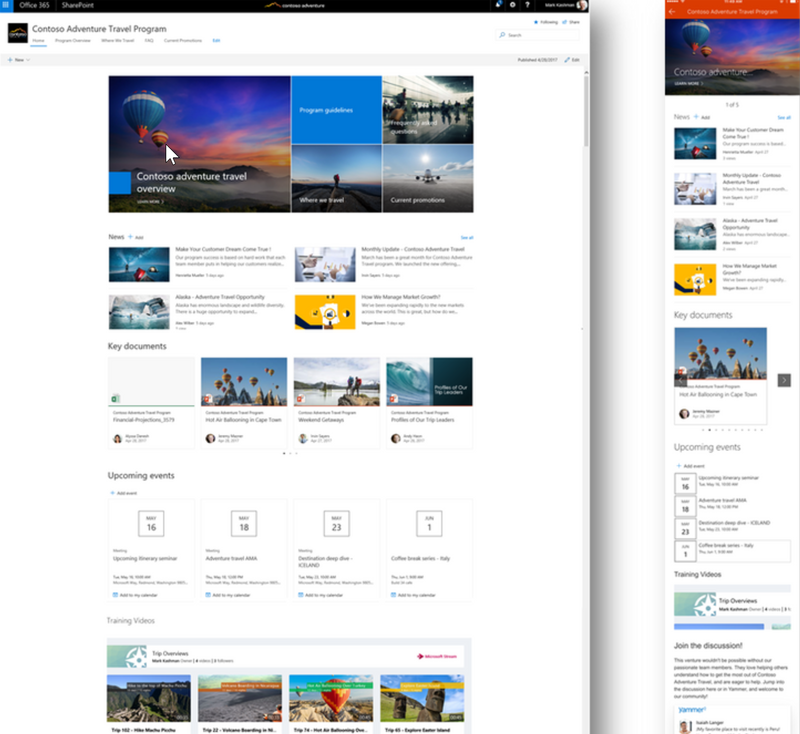 More information about communication sites can be found on the Microsoft Tech Community SharePoint Blog. 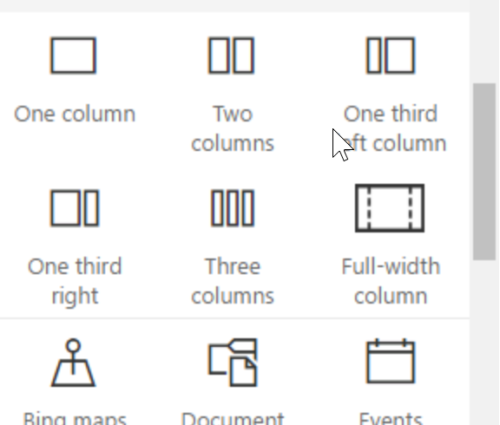 Starting this summer, users will be able to use Microsoft PowerApps to create custom forms that surface right in the context of a SharePoint list or library. 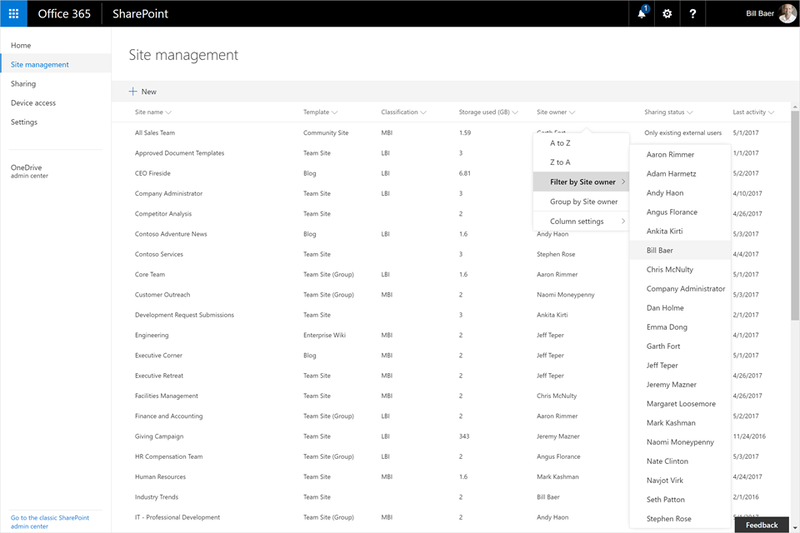 Users can then create, view and interact with data using the custom form, rather than the default SharePoint forms. I don’t know about you but this sounds a lot like the long-awaited InfoPath replacement. It’s not necessarily a big surprise. This kind of investment makes sense for Microsoft, in my opinion. We will see how this continues to evolve. The exact capabilities aren’t publicly known yet, but it’s nice to see PowerApps mature in this way. Microsoft announced that it is continuing to improve how it leverages machine learning and artificial intelligence from Microsoft Graph – in this case by improving search results. Part of the way that it does that, they explained, was to activate people cards in search for people whose skills, interests and projects – part of their Office 365 profile – are relevant to your query. Microsoft is highlighting the importance of people as you perform your searches. There were several other announcements as well. But this is only the next step in a rapidly evolving product. The stage was set last May and this was just another successful milestone as the new “cool” Microsoft continues to reiterate its commitment to an obviously successful, but rapidly changing product. Watch your Office 365 Message center for news about features as they roll out, and look for more news at Microsoft Ignite later this year. 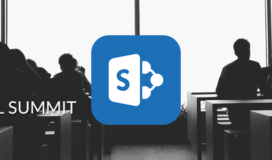 In the meantime, I encourage you to visit the official SharePoint Virtual Summit event summary on the Microsoft Office blog and check back here for updates.